Newton, Iowa, will be home to the next NASCAR Xfinity Series race, the U.S. Cellular 250, on Saturday, July 28, and that’s where race fans will see an Iowa native pledging his support to The Salvation Army’s tornado relief efforts. Joey Gase (35) is having his Iowa Donor Network/Sparks Energy Inc. Chevrolet outfitted with special decals that show donate.salarmywestern.org/iowatornadoes, a Salvation Army webpage that’s been specifically set up to accept monetary donations for communities affected by Thursday’s storms. Captain Pam Kasten, corps officer for The Salvation Army of Marshalltown, is leading the organization’s response and expressed her thanks for Gase and his team’s generosity. 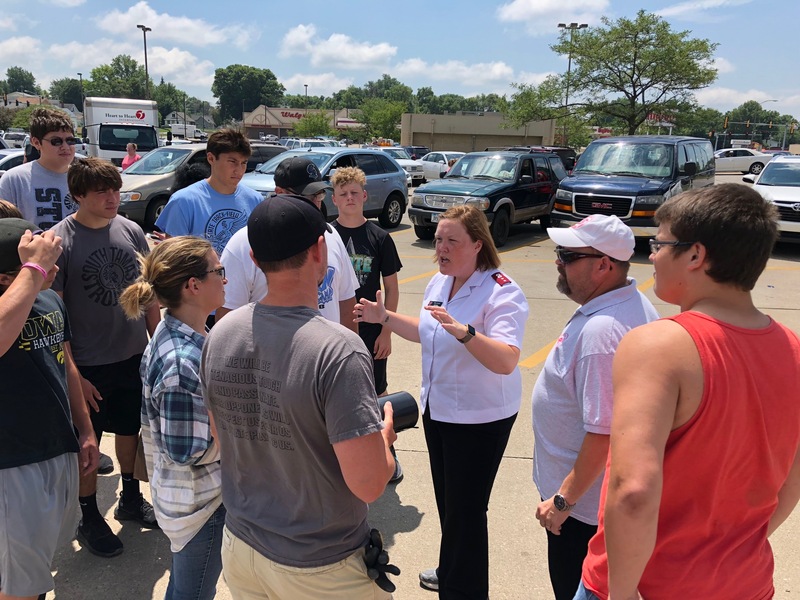 Salvation Army officers, staff and volunteers from all over the Midwest have descended on central Iowa in recent days, with a special focus on relief efforts in Marshalltown. Seven hundred eighty-six buildings there were damaged in last week’s severe weather. Since Thursday evening, Salvation Army units have been bringing food, water, supplies, cleanup kits and other critically needed items to residents and first responders as well as providing pastoral care. The organization will continue those efforts for as long as they are needed. As of Monday morning, under the direction of Captain Kasten, Salvation Army crews had served 12,650 meals and handed out 5,086 cleanup/comfort kits and other hygiene items. They had provided emotional and spiritual care to 250 people in Marshalltown. Some 1,140 hours of volunteer time had also been recorded as of Monday morning. Captain Kasten also said that once power is restored to the storm-damaged Salvation Army corps building in Marshalltown, it will return to normal operating hours, and services such as the emergency food box program and thrift store vouchers will restart. Long-term recovery assistance will begin as well. She thanked volunteers and donors in the wake of the storm. “It has been a blessing to see how the community has rallied." — The best way to help tornado survivors and rescue workers is to make a financial donation. All donations will go directly to the affected communities. Contributions to The Salvation Army’s relief work in Iowa can be made by donating online at donate.salarmywestern.org/iowatornadoes. — New work glove donations are needed for cleanup and can be left in the blue collection barrels inside Heritage Place at Renaissance Village through Friday, July 27. The building is open 24/7 and located at 3612 Cuming St.